3) pay by cash/cheque by making an appointment. Please email or call ​to arrange a time and date. Best times noted below. Thursday, March 28th 7 PM to 7:30 PM. Sunday, March 31st 4 PM to 6 PM. Thursday, April 18th 7 PM to 7:30 PM. Sunday, April 21st 4 PM to 6 PM. Thursday, May 2nd 7 PM to 7:30 PM. Sunday, May 5th 4 PM to 6 PM. Note: Times may be subject to change so please check availability. If you have a physical disability in which you are unable to obtaining the keys yourself and do not have someone to pick them up for you, arrangements can be made to have them dropped off to your house. If you are storing canoes, kayaks or boat lifts, please email for a copy of the appropriate form to be filled in. It is important that you add the description of these items so we can identify who owns them. 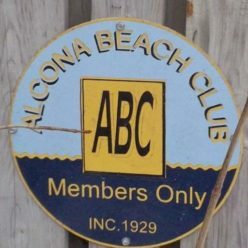 It is not the responsibility of Alcona Beach Club but the responsibility of the owner, who has been given permission to store their items, to properly secure them. It is, however, the Club’s responsibility to make sure that the storage is available for members who have paid for storage. All items that do not have permission to be stored must be removed or the Club will remove them. We have a new form regarding the lending of keys that needs to be filled in and signed by all members who rent out their property or are about to rent out their property. This has to be done before you can obtain the new keys. This will be sent by email. New keys are here and the locks will be changed today, March 28th. Dates available above also apply to swapping your old key for new keys. New key prices have gone up to $30.00. In the past it may have been noted on the applicant forms that you would get the full amount of your deposit back from the price you paid for your key. Correction is that you get your amount you paid minus $5.00. What this means is that if you paid $25 per key you will only receive $20 per key back. Sorry for any confusion this may have caused. Please note that you can now pay your membership fees via etransfer. If you still prefer to pay in person, please email or call the club to make arrangements as to when the membership chair is available. You can also pay in person at the AGM before the meeting starts. Upon approval from the President, if you need to swap out your old keys, for a new one, same applies as above. Email or call the club to make arrangements with the membership chair. This year we are keeping the keys from 2017. Anything older than this will need to be swapped for new ones. The board thanks you for your cooperation in this matter. Date for the special meeting is Sunday April 22nd, at 2pm at the Innisfil Idealab, 967 Innisfil Beach Rd, Innisfil. Hope you can make it. If you cannot attend, please check your email for a proxy form to assign your vote.